From Academy Award-winning director Mel Gibson comes this profound and confronting depiction of the final twelve hours in the life of Jesus Christ. Featuring stunning cinematography and an inspired performance by Jim Caviezel as Jesus, The Passion Of the Christ is a triumphant and uncompromising filmmaking achievement. Mel Gibson funded the film himself and co-wrote the screenplay. He consulted extensively with experts in every aspect of the New Testament world: historical, theological, biblical, linguistic, geographic, architectural, and more, taking great pains to ensure maximum accuracy. The film's main narrative of the Passion itself - drawn from all four Gospels - is supplemented by flashbacks that substantiate key aspects of Jesus life and teachings, such as the Sermon on the Mount and the Last Supper, as well as his relationships with his mother and his disciples. MA 15+. Warning: strong, graphic violence. 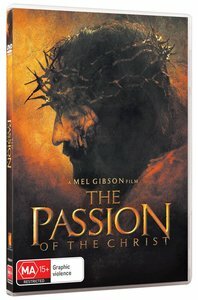 About "The Passion of the Christ"
Customer Reviews For "The Passion of the Christ"
A well produced movie by Mel Gibson starting from the agony in the garden, showing the scourging at the pillar which is very brutal, I needed to close my eyes and it goes for a while so we skipped some of it but overall it was a fantastic movie to watch especially leading up to Easter! A movie worth watching.